Disney XD debuts a new animated television series, Lego Star Wars: The Freemaker Adventures, on June 20th at 10:00 am EST. Last week during my Disney press trip we had the opportunity to screen the first episode and interview the creators, Bill Motz and Bob Roth. They were so excited about the series and being able to finally share it with everyone. It’s the perfect combination of Lego and Star Wars! In the series we follow along the stars, the Freemakers’ family. The family builds and sells starships from their scavenger trips throughout the galaxy where they collect debris of space battles. The youngest family member discovers a natural connection with the Force through an ancient artifact, The Kyber Saber, The families world is immediately turned upside down as they are thrown into an epic struggle against the Empire to restore peace and freedom to the galaxy. Throughout their adventures, the Freemakers explore new worlds, meet new and familiar characters, and learn the true value of what it means to be a family. Bill Motz said him and Bob Roth (the creators) were at comic con when they came up with the idea for the series. They have been working together for 25 years since they met at USC summer production workshop, the same place George Lucas went. Their first conversation was about Star Wars and they’ve been making things ever since. They wanted to explore the idea of a new Lego Star Wars show with some humor. They loved the idea of the characters pouring out the blocks and creating their own thing with their family. I can remember when I was a child we actually did make our own Lego creations. The series was really invented out of that type of play. There’s been so many battles in Stars Wars that there’s lots of busted junk for the Freemakers to collect. Think about when you lose an instruction booklet to that Lego kit your child spent so much time to recreate. All is not lost. Let your child be creative. Let them come up with their own creation. That is the idea behind this series. It’s a great message to our children and to let their creativity shine through. There’s already Lego sets to go along with the new series. We got a first look at the star scavenger and eclipse already built. They also sent each set home with us for our children to enjoy! Bill and Bob actually went to Denmark, home of Lego headquarters, to talk to the designers about the ships. They are so excited to have something they’ve created as a Lego set others can enjoy. At the headquarters to Lego creators actually work with Lego bricks the way an artist works with a pencil and paper. Talk about a fun job! In 1977, Bob said he can remember his brother coming home one not and telling him they were going to the movies. Bob couldn’t imagine any movie being better than Star Trek so he didn’t really want to go. He said he ended up going and it was a magical memory. At seven years old he immediately knew what he wanted to do with his life when he walked out of that theater. He wanted to give other kids the viewing he’d just had. Bill (kids 18,21, 24) and Bob (kids 12, 14) are both dads and they know what’s it’s like raising their kids around Lego and Star Wars. Bill said one night he started building the star scavenger kit and his son, 24, sit down at the table to build his millennium falcon. They sat there building as they listened to the Star Wars soundtrack. Their sons had a really strong influence on the show. Bob said one of his son’s struggles with ADHD which is very much like the character Rowan in the series. I love the fact that he made his son who struggles with that the hero of their show. This is a great message parents can relate to with kids of ADHD. Every episode in the series is fun. Everyone struggles with a lot of serious things so they wanted to make it a fun show for families to enjoy together. The characters are funny and there’s a lot of joy in all of them. There’s even jokes for your hard-core Star Wars fans, which is both of the creators. The great thing about this series is that it appeals to boys and girls. Bill said his 18 year old daughter even loved it. Both creators’ children loved the series and got to see a sneak peek at the first three episodes. It is a great series that allows role-playing for kids. The characters are constantly growing in the series. Things will keep changing in their world and universe. Things don’t always turn out the way you hope for so they really wanted to make the series like this where circumstances can change, things can happen. While we were there we also got the opportunity to speak to 12 year old newcomer, Nicolas Cantu, the voice of Rowan. He said it was an absolute dream come true to work on something that comes with the whole package – Disney, Lego, Star Wars. Bill said when Nicolas came in to audition he was so natural with everyone and owned the room. Bob chimed in to add that Nicolas is an incredibly talented and intuitive actor. Nicolas loves all the Lego jokes in the series along with the classic Star Wars storytelling we’ve come to know and love. He said kids will love the mix of adventure, action and comedy. He loves all the wacky and wonderful characters too. 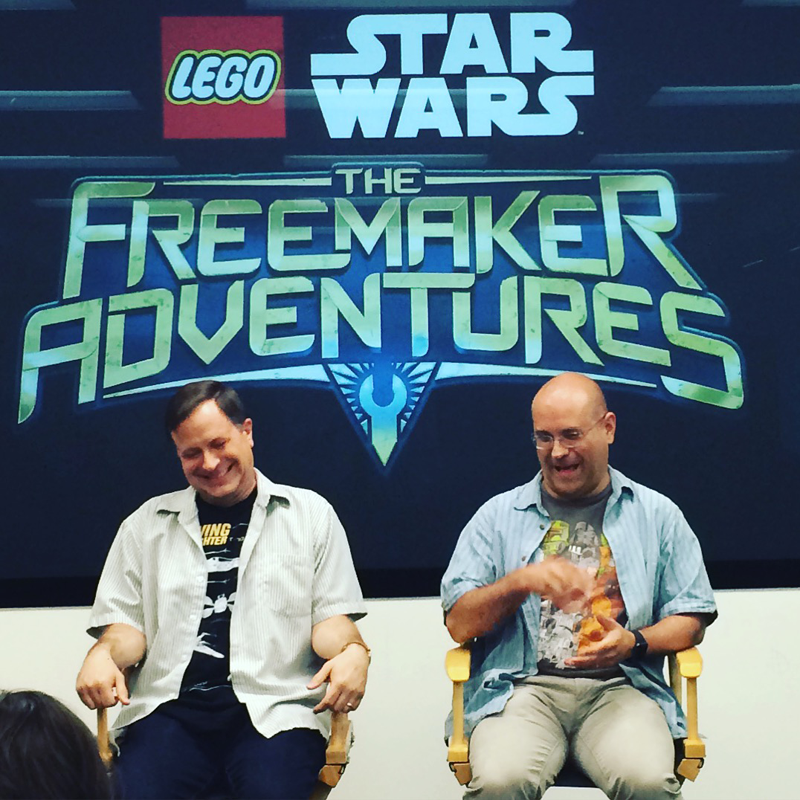 Lego Star Wars: The Freemaker Adventures, premieres on Disney XD June 20th at 10:00 am EST! I am going to share this post with my son when he gets home. I think he will enjoy reading it. Thanks. I have got to check out this show. All of the “Lego Star Wars” one-shot specials have been so funny. I love how Disney has done such a great job of expanding the Star Wars universe. “Star Wars Rebels” on Disney XD is one of my favorite programs!